On your profile, under your Tools menu select "Upload Kit" or "Create Bundle". You can either create the bundle first and list it on all the kit pages, or you can create the bundle last and list all the included kits on the bundle page. Whichever works best for you is the best option! First, add the title of the bundle. Bundle names should always include the word "Bundle" at the end. You may also enter a description if you wish. The description can help people find your bundle, so a good description can help you out. In the next section upload a preview image for your bundle. Keep in mind that the site will automatically add the Pixel Scrapper Commons logo to the bottom left corner. You may download a sample preview image here which you can use if you'd like. In the next section enter the main colors of the bundle and the most descriptive tags for the bundle. Please see here for help with tagging. In this section you may list the kits included in the bundle. If you have not created the kits yet, that's fine, you can instead list the bundle on the kits' pages when you create them. First, add the title of the kit. Kit names should always include the word "Kit" at the end. You may also enter a description if you wish. The description can help people find your kit, so a good description can help you out. 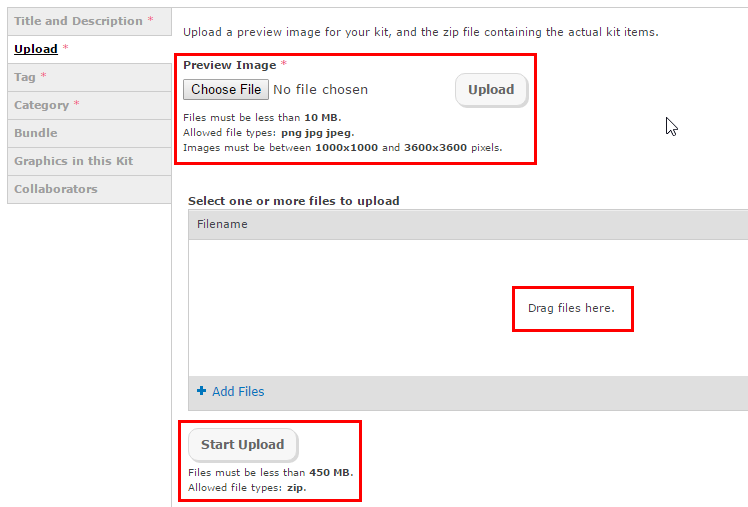 In the next section upload a preview image for your kit. Keep in mind that the site will automatically add the Pixel Scrapper Commons logo to the bottom left corner. You may download a sample preview image here which you can use if you'd like. Include the kit preview image (option to include bundle image as well). Be sure all graphics are in a folder BEFORE zipping. In the next section enter the number of graphics in the kit, the main colors of the kit and the most descriptive tags for the kit. Please see here for help with tagging. In the next section choose the category that best represents the kit. Some categories have subcategories so take a look through the list to familiarize yourself with all the options. You may enter the name of the bundle here. You can also list the name of the kit on the bundle page once the kit has been created. If you are adding the kit after the graphics, you may list all the graphics you want included in the kit here.